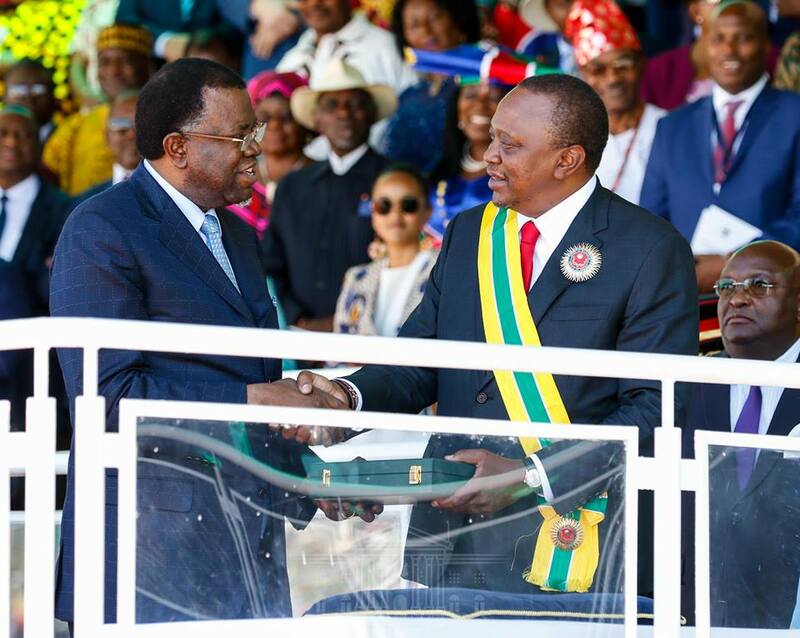 Windhoek – Namibia has on Thursday bestowed the country’s highest honour to the President of Kenya, Uhuru Kenyatta, in appreciation for the role his country played to help the former gain independence. 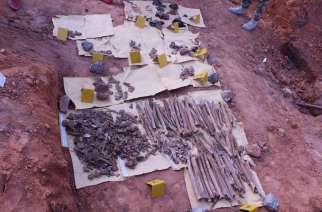 Kenyatta was honoured with the Grand Commander of the Order of the Most Ancient Welwitschia Mirabilis First Class. President Hage Geingob conferred the honour during the commemoration of the 29th Independence Day at Independence Stadium ion Windhoek. It is the highest honour on the Namibian honouring system as provided in the Conferment of National Honours Act, 2012 (Act No. 11 of 2012). Speaking at the well-attended event, President Geingob said Namibia remain eternally grateful to the people of Kenya for their contribution to the country’s freedom and enhancement of its prosperity. 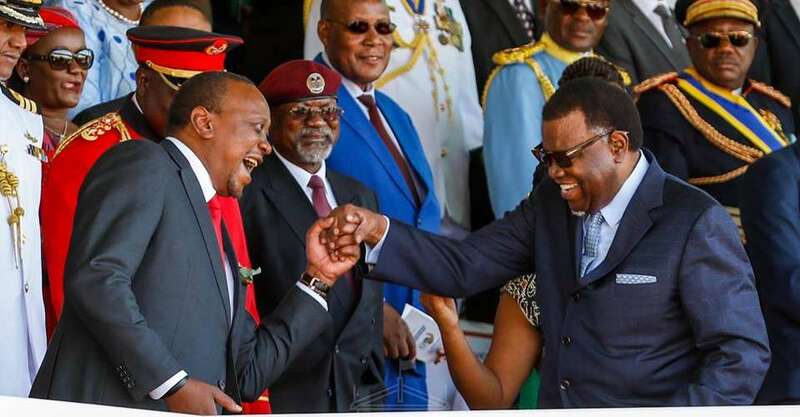 Geingob said Kenya is one of the countries that contributed troops in 1989 to be part of the United Nations Transition Assistance Group (UNTAG) to monitor the UN-sanctioned electoral process in Namibia. 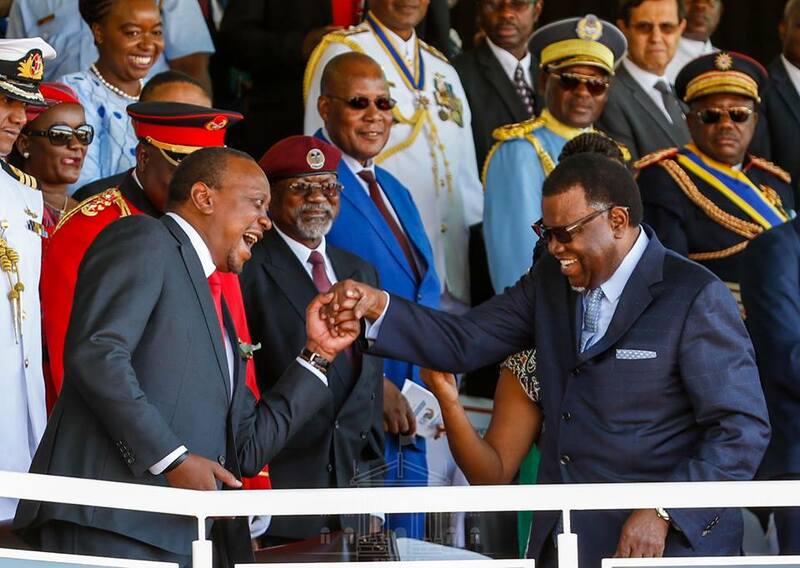 “In the aftermath of the successful, free and fair elections of 1989, and our subsequent independence, Kenya was there to assist us until we became steady on our feet,” Geingob said. After the successful elections and the redeployment of the UNTAG troops, Namibia founding President requested his Kenyan counterpart at the time, Daniel Arap Moi to delay the redeployment of the Kenyan troops to help maintain peace. The Kenyan Blue Helmet Contingent have also assisted with the establishment of the Namibian Defence Force (NDF), at the cost of the Kenyan Government, according to Geingob. Besides training, the Kenyan contingent also provided logistical support to the NDF in the form of uniforms and other items. The imprint of the Kenyan assistance is still visible in the ceremonial dress of the NDF’s Guard of Honour Unit. “This is the reason I say that Namibia is a Child of Pan African and International Solidarity, midwifed by the United Nations. It is always pleasing to be able to celebrate one’s anniversary in the company of friends and today, amongst many of Namibia’s regional, continental and international friends present here; we have a very special friend in our midst,” he said, referring to assistance rendered by the international community during Namibia’s war of independence. President Kenyatta attended the celebrations as guest of honour. 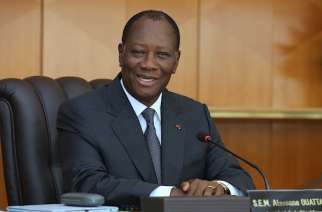 He said the strong and brotherly ties between the two countries, is rooted in history going back to when Namibia was fighting for independence against the South African apartheid regime. 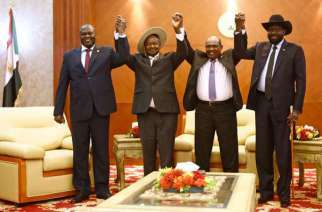 Kenya is one of the countries that provided material support to the people of Namibia during their struggle, he said. Kenya also provided training to many Namibians in exile in the fields of education, health, agriculture and defence. “I am happy to note that the future of Kenya and Namibia are inextricably linked and intricately bound. Our two countries will continue to cherish our history of fraternity and togetherness in pursuit of greater unity on the African continent,” Kenyatta stated. He further commended progress that Namibia has made since gain independence in March 21, 1990. “Namibia, you have come of age, and as your elder sibling, Kenya wishes you become a beacon of hope for the rest of Africa to admire,” he said. President Kenyatta will remain in Namibia for the State Visit until his departure on Sunday, 24 March. The visit follows on the state visit of President to Kenya in October 2018, when the Namibian leader was the special guest at Heroes Day Celebrations. During the visit, the two African leaders discuss bilateral relations and deepen cooperation in the areas of transport; fisheries and marine resources; trade and commerce; information communication technology; agriculture; health; defence and security; mining and education.